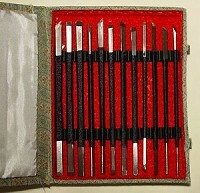 Special knives for carving stone stamps. Good quality steel. Some knives have double head blades to give longer usage life. Comes in a beautiful silk box. Each knife is about 5-1/2" long. Don't forget to get a vice 9our stone holder- ASH-26021) to hold the stone while you are carving. I am just learning how to carve the soap stone chops. I got these tools and I am VERY pleased. They are an excellent value. They a nice quality, come in a beautiful box and are nice and sharp. It will be some time before my skill level surpasses the quality in these carving tools, maybe never. I am very pleased with these.